One is tempted to believe that this is their quality first "born" a country that is the rarity of a stamp, it is not so, and many other factors come into play. Take the One-Cent Magenta British Guiana, sold 9.5 million dollars (around 7 million euros) June 17, 2014 in New York. British Guiana had its own stamps since 1850, when in 1856 the boat carrying the stamps from London was wrecked and the cargo was swallowed by the waves. Quickly stamps ran out, and the Postmaster General was obliged to find a solution. At Georgetown, the capital of the colony, was a printer able to manufacture a draw quickly to make up for the shortage. It was therefore decided to create a rectangular stamp, with its center in a sailboat surrounded by the motto of British Guiana; "What Damus Petimus Vicissim". Appears above the word British, below Guiana, left and right oven Postage cents. It was added to prevent any counterfeiting, additional claw. So far, nothing out of the ordinary, if not by mistake on one of clichés, was printed "one percent" and even if we quickly repaired this error, some stamps had already been sold. Le Tre Skilling Yellow of Sweden of 1855, several competing theories about the reason that could lead to this error. Indeed the normal color of the 3 skilling is green, even as the yellow was reserved for the eight skilling. Confusion at the printers which case at least one sheet was printed, or a piece of the plate would have broken the 8 skilling and in this case the piece was replaced by a 3-skilling ... We certainly never know, always Is that by 1886, Georg Wilhelm Backkman discovered the stamp in the effects of his grandmother. 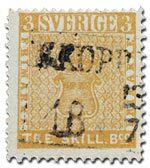 This stamp underwent many controversies, it was declared false by experts to have been green discolored skilling March 1, the pinnacle came when the Swedish Postal Museum also called it the infringement. It was not until a further review, by two different philatelic authorities finally the Tre Skilling resume its place authentically unique timbre despite the repairs he had suffered. Many celebrities have had the Tre Skilling in their stamp collection, including Charles II of Romania. Once sold 2.3 million dollars in 1996 he sold in 2010 "at least" at this price to the French entrepreneur Armand Rousso (then owner of Arthur Maury). Two other stamps defray the philatelic history, this is the One Penny and Two Pence of Mauritius. In 1847 you ask a writer of the island make a model for the two stamps, featuring a Queen Victoria's profile and values One Penny and Two Pence. Would also appear to the right of the stamp the word "Mauritius" and left "Post Paid". Instead of writing "Post Paid" the writer wrote the words "Post Office". The wife of the governor of the island, Lady Gomm used some of these stamps to send invitations to the ball from 21 September 1847. Much later they found a few copies of each of these stamps in trading companies archives and even in 1866 on the quays of Bordeaux! It is thought to remain only around 26 copies of Two Pence Post Office. In this 1849 years, France made his first stamps depicting a head of Ceres, with 20 black centimes (Yvert et Tellier No. 3) on 1 January and 1 franc vermilion (Yvert et Tellier No. 7) on January 2. The postal administration decided commissioning in December of 40 cents orange. To avoid confusion with 1 franc vermilion the decision was made to change its color to dark carmine (Yvert et Tellier No. 6). By this decision, the Vermilion already little used became one of five or six rarest stamps of France. In 1931, was discovered a block of 22 new copies. In order to negotiate it was necessary to debit the block into eight or four. Inside one of these blocks of 4 was a pair head to tail, the odds of this block would be around the tidy sum of € 1.5 million.